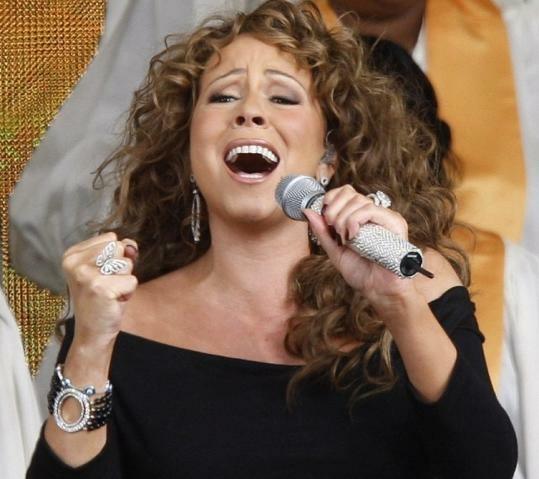 There’s always a moment on a Mariah Carey album when her voice sounds like a helium balloon suddenly released to drift into the stratosphere. She trills, she wails, she coos, and then somehow she crash-lands back into the melody right on cue with her diva tresses perfectly in place. Her voice, with its many peaks and valleys, has always been her calling card. But “Memoirs of an Imperfect Angel,’’ her 12th album released today on Island Records, presents her as more of an emotive vocalist and not just a singer with an impressive range. Make that Mariah Carey, song stylist. That’s not to overstate the album’s importance in her catalog, though. Obviously a vanity record that builds on past glories, “Memoirs of an Imperfect Angel’’ is a throwback to the simmering R&B of her earlier work, particularly 1997’s “Butterfly.’’ Always fond of the big ballads, Carey elevates the sensual slow jam to an art form here. It’s vintage Mariah, as if no one ever told her about Rihanna topping the pop charts with “Umbrella,’’ Katy Perry locking lips with a lady, and Leona Lewis shamelessly copping her style circa “Vision of Love.’’ The album reminds you that those budding superstars can’t beat Carey at her own game. “Memoirs of an Imperfect Angel’’ might sound like it was made 10 years ago, but there’s no mistaking the artist behind it. Carey aggressively pursued hip-hop collaborations in the late ’90s, but here she’s essentially solo and in the capable hands of writers-producers The-Dream and Tricky Stewart, who, coincidentally, have worked their magic with Rihanna. (That might explain the transparent echoes of Rihanna on the chorus of “Standing O.’’) To their credit, The-Dream and Stewart keep the songs mostly uncluttered, and many of them trail off into languid fade-outs, suggesting Carey is certainly not in a hurry. Starting with “Betcha Gon’ Know (the Prologue)’’ - “Welcome to a day of my life,’’ she begins - Carey introduces the album as a song cycle about love’s pitfalls. But eventually that cycle spins into circles; halfway in, “Memoirs’’ starts to sag under its own weight, and the sweetness that initially was so irresistible starts to get a little too sticky. No stranger to putting her pipes to work on power ballads (Journey’s “Open Arms,’’ Harry Nilsson’s bombastic-fantastic “Without You’’), Carey closes with Foreigner’s “I Want to Know What Love Is.’’ At first understated, by the one-minute mark it’s like an opened can of Pepsi left in the fridge for a month: flat and in need of some fizz. Like most of this album, the cover finds Carey well within her comfort zone, eventually ramping up with a gospel choir and a clear message: This one’s coming soon to a wedding reception near you.